Susan Mallery, the New York Times bestselling author of Three Sisters, is world renowned for her “insightful, funny, and poignant” stories (Booklist). With her brand-new Mischief Bay series, she brings vivid color to the story of three friends on the brink of a new life. Nicole Lord wants to be a good wife, but there’s a difference between being supportive and supporting her husband, who quit his job to write a screenplay she’s never seen. He won’t even help take care of their son, leaving Nicole to run the house and work full-time. If you have not read any of Susan Mallery’s books you really need to. 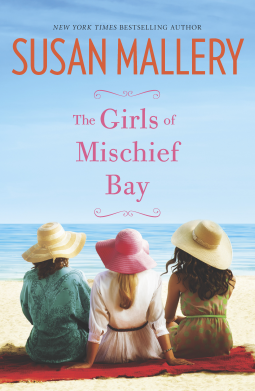 This is a new series by Susan Mallery and I really enjoyed the book. It was hard to put it down once I started reading it. Mischief Bay is in southern California. Nicole runs a business that offers exercise classes. That is were she meets Shannon and Pam. They become good friends. The story starts with Pam having a hard time when she gets her daughters class reunion invitation. She thinks her life is boring and wants to spice it up a bit. Nicole’s husband quits his job to write a screenplay without telling her he was quitting and then doesn’t help with the house or their son. Shannon is happy being VP at work and happy with her single life until she meets Adam. Things don’t end up like any of them think they will and they become better friends and stick together through all of the changes. When this comes out in February make sure you pick up a copy of it.